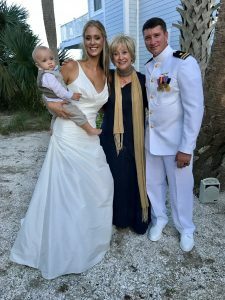 Nathan’s schedule as a Naval Officer was challenging when he and Bride Harriet were planning their wedding. However, on a perfect evening with their closest family and friends- and their toddler son -as witnesses outside of their rented home on ST AUGUSTINE BEACH,… REV JOY BLESSING guided them in saying vows to “faithfully love each other above all others…to stand with and for each other through all of life’s challenges … and all of life’s joys… in sickness and health…. with all their hearts… all their lives…”….. followed by a prayer led by Rev Joy Blessing: “ Dear Loving God, thank You for Your Love…and especially for the love within the hearts of Nathan and Harriet for one another that has led to their desire to join in marriage. We ask for Your Hand to be upon them…as their Protector, Strength and Savior. Bless their marriage with bountiful joys, laughter,peace and pleasures. May their home be an oasis of endless love, enduring hope, supportive encouragement and steadfast unity. In Your Name we pray AMEN!